Jacques Louis David is a French painter known for painting in the Neoclassical style. He was highly influential in that he painted with a type of history painting that is marked by heightened emotions in a classical manner. He was also known as a supporter of the French Revolution. 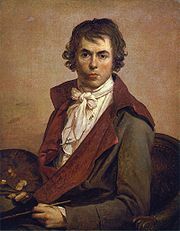 Jacques Louis David was born on August 30, 1748 in Paris, France. He was born in a prosperous family but was unfortunate to have his father killed in a due when he was about nine years old. His mother put him in the care of his wealthy architect uncles who ensured that he received an excellent education. Jacques Louis David was preoccupied early on with drawing and eventually desired to be a painter. He went on to learn the art from Francois Boucher who was a distant relative and a leading painter in his time. David attended the Royal Academy which is now the location of Louvre. He also won an art scholarship in the French Academy in Rome. There he was able to study the classical styles of the Italian masters which influenced his works later on. After studying art, David went on back to Paris where he easily got into the art circles, mainly with the help of influential friends and acquaintances. He sent two paintings and was exhibited in the Salon, considered to be a high honor for an artist. His works mainly reverted away from the usual Rococo style which was by then getting outdated in France. He started painting in the Classical style and hence helped bring back the styles used by ancient masters but used modern subjects of his time, usually of historical significance. David became an active supporter of the French Revolution and started to paint numerous propaganda materials by virtue of his paintings. David also tried to catalogue the modern heroes of his time, most notably in his work Oath of the Tennis Court. His political activism even had him imprisoned for awhile, only to be released due to the intervention of his wife. David became confused with the politics in the 1790’s but eventually gained another hero with the emergence of Napoleon in 1799, which became his main subject matter. But he also did not survive the fall of Napoleon from power and he retired in exile to Brussels sometime in 1815. He later died there on December 29, 1825 at the age of 77.